Riegler is a system supplier of medical technology for the pharmaceutical sector, diagnostics, and the cosmetics industry. The company has specialized in rapid, customer-specific product development for 70 years. One of the Riegler’s core competencies is the integrated production of highly complex plastic products under clean-room conditions. 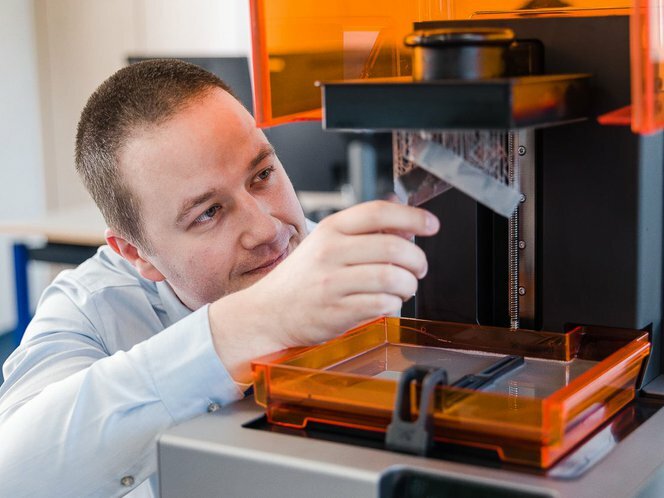 Head of Design and Development at Riegler, Klaus Oswald, used desktop 3D printing to create a prototype that secured a contract from a leading diagnostics company for a highly complex product that would have to be manufactured in high volumes. Within days, instead of weeks, and at a fraction of the cost, Oswald and his team were able to create prototypes for the customer. Using 3D printing, they could quickly and safely check the suitability for production in millions of units and for fully-automated assembly. Read on for more details on how Kalus brought stereolithography (SLA) 3D printing in-house, enabling Riegler to reduce development times and uncertainty while increasing his chances of winning contracts. Riegler faced several challenges during the development and production of their components. First, the product needed to be manufactured in high volumes and assembled fully automatically. This included laser welding and camera inspection, which meant extensive checks had to be made prior to production. The second challenge was the development of the actual containers, which had to be compatible with a wide range of analysis substances and capable of being processed in new and existing fully-automated blood analysis devices. The containers also needed to be securely transported (also in low-pressure conditions on an aircraft) and able to tolerate a wide range of process parameters. For many years, Riegler outsourced 3D printing for rapid prototyping of highly complex models, which were initially used for the contract in development and for extensive testing. Over time, the costs and time involved in working with suppliers proved too high to be economically viable. This prompted Riegler to invest in its own in-house stereolithography (SLA) 3D printing system. 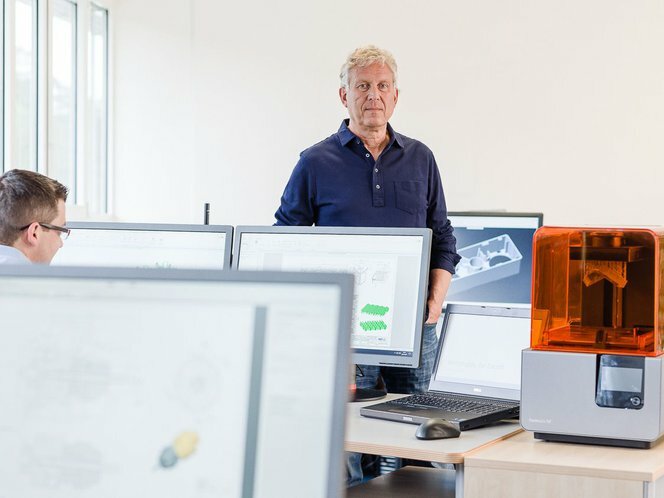 Klaus Oswald and the development team at Riegler work with CAD and use in-house desktop 3D printing to rapidly develop customer-specific products. Once the 3D design is ready, Riegler can use its in-house desktop 3D printer to create an initial prototype and rapidly develop it further. The printed prototypes optimize the internal development and production process and also make orders more secure. Riegler’s development department uses 3D printing to create prototypes for complex system components. Here, a cartridge cover is 3D printed using Formlabs Grey Resin at 25 micron resolution. In an ideal scenario, the developers at Riegler only need one day and one night to turn an idea into a physical model using the Form 2 3D printer. With an external 3D printing partner, the same parts would have required a lead time of 1 to 2 weeks, plus at least one week for requisitioning and procurement in house. The new system delivers enormous cost savings. The cartridge cover for the diagnostics system would have cost €250 with an external supplier. The material costs for in-house 3D printing came to just €60. Formlabs Standard Resins has all the characteristics of a polypropylene- and polyethylene-like surface. It allows strengths and functions to be tested and errors to be eliminated. In the future, Riegler plans to use the mold inserts printed on the Form 2 to manufacture parts in the original material (polypropylene, polyethylene) using an injection molding machine. Making molds with Formlabs’ High Temp Resin is another step towards permanently embedding in-house 3D printing technology at Riegler. “We have had our Form 2 for a year now and print almost every day for almost all development processes. In the past, when we worked with external service providers, we only used 3D printing in exceptional cases. Having 3D technology in house has increased our chances of winning orders. Riegler’s design and development department uses CAD to transform initial customer ideas into molds suitable for use with plastics and, later, for economically viable production. These complex assemblies are produced in production runs of several million using extrusion blow or injection molding processes. This means that the company has to carry out extensive tests and rapidly develop innovative systems. Using the Form 2, Riegler has reduced its lead time for complex system components by 90% and cut costs by 76%. By bringing 3D printing in-house they have been able to reliably develop proof of concepts while testing functional prototypes with a wide range of materials. Check out our industry page to learn more about how engineers & product designers are using the Form 2.